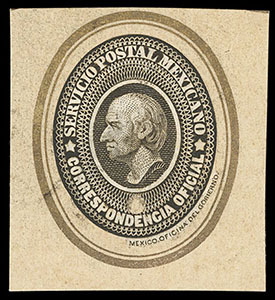 Mexico, Official, 1884 dark brown, trial color die proof on India, 35x39mm, bright and fresh, Very Fine, very rare. Scott No. O1TC Estimate $300 - 400. 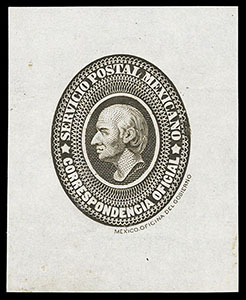 Mexico, Official, 1884 brown, trial color die proof on India, cut to shape and mounted on cardboard with gold frame, security punch hole below portrait, Very Fine, the only known example. 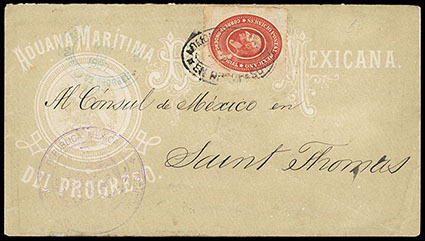 Mexico, Official, 1884, red, on 1887 tan overall shaded official cover from the Maritime Customs office to Saint Thomas, tied by Progreso oval handstamp, reverse with N.Y. transit and receiving cds; some light perf toning and small scuff, still Very Fine, the only known cover with official stamps sent abroad other than a handful sent to the U.S.
Scott No. O1 Estimate $400 - 600. 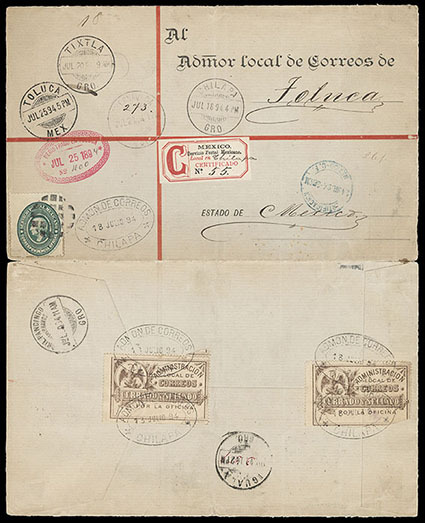 Mexico, Official, 1893 blue green, tied by segmented cork handstamp on 1894 registered cover from Chilapa to Toluca, with numerous transit cds's, reverse with two "Cerrado and Sellado" seals tied by Chilapas date stamps; cover opened at sides for display, Very Fine. Scott No. O4 Estimate $300 - 400. 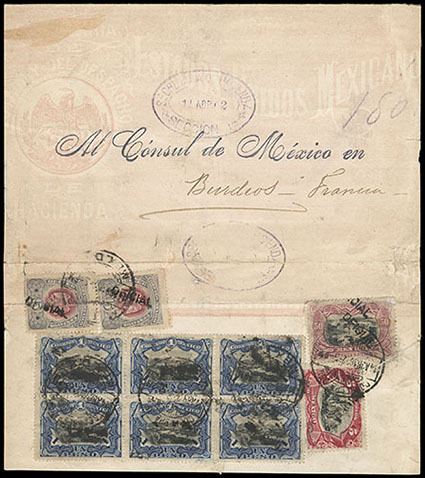 Mexico, Official, 1900, 5p carmine & black, in combination with Official, 1900, 15c two singles + 50c + 1p block of six on overall Finance Ministry cover used as a wrapper, addressed to the Mexican Consul in Burdeos, all tied by 1902 Mexico cds's, Very Fine, the unique on cover usage of the 1900 5p Official issue, this is the largest franking ($11.80) and one of the most important official covers of the issue. Scott No. O58+O54+O56+O57 Estimate $750 - 1,000. 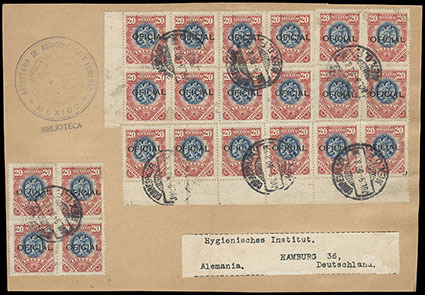 Mexico, Official, 1899, 20c rose & dark blue, block of 8, two blocks of 4 and horizontal strip of six, canceled by 1900 Mexico cds's on package front to Hamburg, Germany, with "Secretaria de Agricultura y Fomento, Biblioteca" cachet, Very Fine. Scott No. O55 Estimate $150 - 200. Mexico, Official, 1916, 5p carmine & black, Corbata overprint, top margin single, o.g., never hinged (hinged in selvage), beautifully centered amid huge balanced margins, an Extremely Fine jumbo, certainly one of the finest of only 50 stamps issued; with 1949 P.F. and 2012 M.E.P.S.I. certificates. 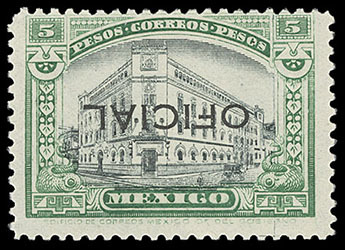 Mexico, Official 1927, 5p green & black, overprint inverted, o.g., never hinged, fresh and Fine; with 2000 M.E.P.S.I. certificate. 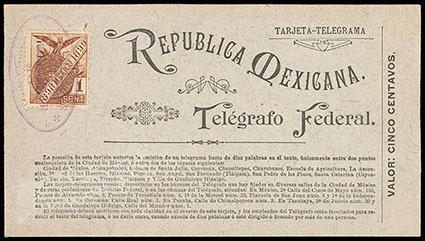 Mexico, 1897-98 "Telegrafo Federal" telegram form cards, two different unused cards; one card with 1897-98 1c orange revenue stamp print and 10c to 5c revalued print at right, other a card with 1897-98 1c orange revenue stamp print with 1c red brown revenue stamp placed over and tied by violet handstamp, both with message form on reverse, Very Fine, these 2 cards of which very few have survived are the listing copies for the old Stevens catalog. 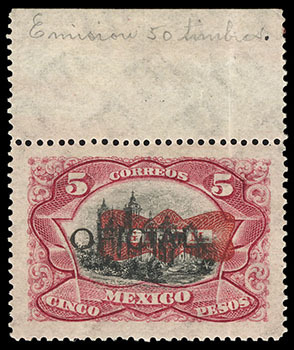 Beginning in 1896 Documents and Libros revenue stamps were used to pay the 1c telegraph tax in Mexico city on postal cards. The reverse was used for the addressee and message. As confidentiality restrictions required their destruction by the Telegraph office no used cards appear to have survived. 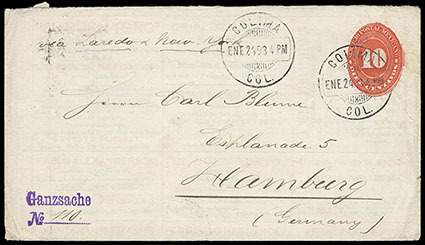 Mexico, 1892, 10c vermilion, advertising sheet and envelope, entire addressed to Hamburg, Germany, with indicia canceled by 1893 Colima cds with second strike alongside, appropriate transit and receiving backstamps, Very Fine, a rare overseas usage. These covers contained a flyer inside with private advertising and a 10c embossed imprint. The buyer would only pay 5c (half the rate) on condition that the flyer was included with the correspondence. Very few are known used, and are particularly rare going abroad.